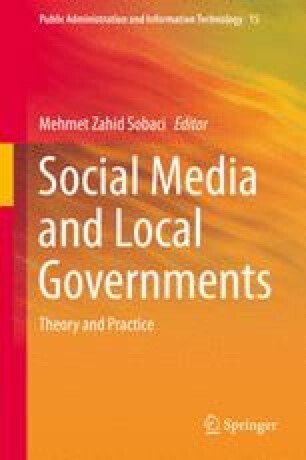 This chapter explores social media adoption and use by Australian capital city local governments. Despite digital communication with the community being an integral part of modern local government functions, the types of digital communication being used are not commonly monitored or analyzed in the Australian context. This chapter provides an investigation of the types of social media being employed by local governments and a sentiment analysis of Twitter accounts from a sample of local governments in Sydney. The results suggest that social media is being used in a variety of forms according to the size and function of the local governments and is influenced by the level of Twitter activity undertaken by the mayor. Australian Bureau of Statistics (2012). 2011 Census QuickStats. Retrieved June 29, 2014, from http://www.abs.gov.au/websitedbs/censushome.nsf/home/quickstats. Australian Bureau of Statistics (2013). 3218.0—Regional population growth, Australia, 2012–13. Retrieved July 23, 2014, from http://www.abs.gov.au/ausstats/abs@.nsf/DetailsPage/3218.02012-13?OpenDocument. Australian Government (2014). The Australian Government. Retrieved July 23, 2014, from http://australia.gov.au/about-australia/our-government/australian-government. Klout (2013) How the Klout score is calculated. Retrieved January 16, 2013, from http://www.klout.com/corp/klout_score. O’Reilly, T. (2005). What is web 2.0? Design patterns and business models for the next generation of software. http://oreilly.com/web2/archive/whatis-web-20.html. Smith, A. (2010). Government online. Pew Research Center. Retrieved May 31, 2010, from http://www.pewinternet.org/media//Files/Reports/2010/PIP_Government_Online_2010.pdf. Twitalyzer (2012). Twitalyzer. Retrieved December 16, 2012, from http://www.twitalyzer.com/5/index.asp. United Nations (2014). United Nations E-Government survey 2014: E-government for the future we want. Retrieved October 22, 2014, from http://unpan3.un.org/egovkb/Portals/egovkb/Documents/un/2014-Survey/E-Gov_Complete_Survey-2014.pdf.